How solid is your plan of attack? Step 1. Where are you on this chart? Step2. Check out your plan. Are you pretty sure what career you want to go into? Yes No, still have some concerns. you have a realistic sense of what the field is about. To convince them of this, you need some facts. What are current issues that people are working on in the field? What are the realistic job opportunities? What can someone getting your degree realistically accomplish? If you know this info, it will show them that you are serious enough to have done the research. If you don't know this info, you may inadverently say something that they know is unrealistic or naive. Tell more about careers Take me to the next question. I'm done. What's the Admissions SuperForum? It's good to deal with those concerns now. First, you will need to speak intelligently about your career in your personal statement. Second, you can save yourself a lot of time and headaches by getting a clear idea now of what you want to do. The following questions have to do with your personal goals and values in a career. Pay. What are realistic salaries in this field? Options for growth. How much creativity does this work include? How much variety? What are the options for growing in different directions in the future? Working conditions. What are the personalities like of people in this field? How much or little pressure is there in the work place? How much flexibility in schedules? Location. Will I have to relocate to get a job? Reality Check. What do people in this field actually do? Are my goals for what I'd like to do realistic, ie is it the kind of thing that people are doing now? What kind of companies do they work for? Are there any jobs? You might feel a little lost addressing these questions. Here are some hints. Find people who are doing the kind of work you'd like to do. Search nationally. Find the best. Ask them about some of these issues above. Talk with professors nationally teaching in your field, especially those whose interests are similar to yours. Take some time to visit some of the most interesting companies, organizations or individuals doing what you'd like to do. Travel nationally. Spend a few days or so at each. Ask questions and observe. to ask questions and see what others have to say. Work with a professional career counselor. Look in your local yellow pages. We have also referred many students to Jane Finkle , who works with clients nationally. If you haven't yet decided on your field, it will probably make sense to put everything else on hold for now. Next Question. Do you know when you will start grad school? Yes No. What issues do you have to resolve to figure out when you would start grad school? to see what other people are doing. Do you know which schools you want to go to? Yes. No. Each school has different deadlines and different requirements for the GRE. Do I need to go to a prestigious school in order to get the kind of job I want? What are the schools that would give me the best training in my specialty? What climate do I want to be in? Where would I feel most comfortable with the people and culture? What schools would I love to go to even though they might be a stretch? Where could I get in for sure? 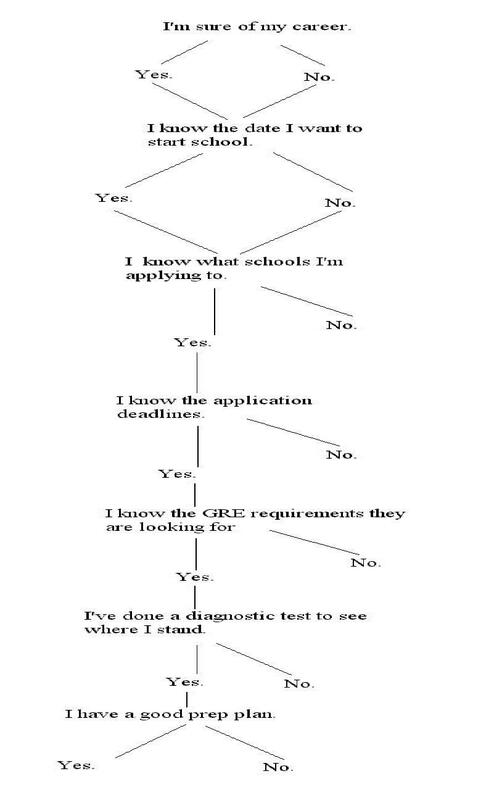 Do you know the admissions deadlines for materials and for the GRE? Yes. No. Sometimes they are almost a year before your classes start, sometimes a month before. These vary from school to school and department to department. Call them. This is one fact they are usually very clear on. For the GRE scores, ask if the school will accept unofficial GRE scores. The unofficial score is the score you get immediately upon finishing your computer test. For the most part it is exactly the same as the official score will be. The official score, however, may not arrive at the school for up to 3 weeks. So if they will accept the unofficial score, you can take your test a few days before the deadline, giving yourself 3 extra weeks of valuable prep time. If they insist on the official report by the deadline, it will be wise to allow at least three and a half weeks. Do you know what scores you need on which sections of the GRE? Yes. No. This info can be hard to weasel out of them. Remember, this will vary from school to school. Many schools only look at two of the three sections of the GRE. They may or may not tell you this. Here are some questions you can ask to try to get at the truth. It's probably good to ask several different people. These can include the departmental secretary, a graduate or undergraduate advisor or admissions director. Which sections of the GRE do you look at? Are any sections more important than others? If there is a section you don't look at, is it ok if I just get a zero on it or would that look bad? What scores do you look for? If it's a cumulative score, is it for 2 or 3 sections? Are those minimum scores, average scores, competitive scores? Have you taken a diagnostic test to see if you are close to the score you need? Yes. No. You can download the GRE's free official PowerPrep software at the ETS site, gre.org . and also a free paper format actual GRE there. I highly recommend that you use the paper test for your diagnostic. There are two reasons. First is that the PowerPrep, even though it is computer based, has proven to not be as accurate a diagnostic score as we'd like. Secondly, there are only two tests on the PowerPrep and I feel it is critical to save those to evaluate and refine your timing strategy toward the end of your prep process. You might not want to know the bad news, but it is much better to find out in advance where you stand. It is also good to get a copy of Practicing to Take the GRE General Test, also from ETS, for about $18. These are actual previously given GRE's. It is important to do your practicing only with actual GRE's. Almost all commercial books contain simulated tests, not actual ones, and often don't accurately represent the patterns of the GRE. Do you have a prep plan? Scoring consistently about 40 points higher than where you need to be? You can probably do ok prepping on your own with a couple commercial books for some guidance. Scoring about or just below where you need to be? It's best get above your goal, since people tend to drop a bit on the actual test. If you have 4 to 6 months to prep, you may be able to get there on your own. 20 points or more below your goal? OR have less than 6 months to prep? You can probably benefit from getting instruction on the hidden agendas and hidden patterns of the test which you would be unlikely to pick up from commercial books. What's the best prep? Most commercial programs have the serious drawback that you are working with an instructor who, though probably very bright with great GRE scores, has very limited experience teaching the test. Even if an instructor has taught for a season or two, this is still very part time. Jay Cutts is one of the few, and possibly the only, full time, experienced test prep specialist with whom you can work one on one. He has designed the Cutts Personal GRE Tutorial so that you can work in the convenience of your own schedule, can get expert one on one guidance regularly from him at your convenience and can work as long as you need to with him at an affordable cost. You can also call Mr. Cutts directly, day or evening, at (505) 281-0684. How does the Cutts Admissions SuperForum help students succeed? This is a web discussion board that puts you in touch with people around the country and world on issues related to grad school admissions, the GRE and career choices. Ask questions. Get answers. Get the inside info on careers, schools, application strategies and other resources. Share discoveries, concerns, frustrations. Find other people whose plans are similar to yours. Come visit. The SuperForum is free. Use it as your main source for planning your application.